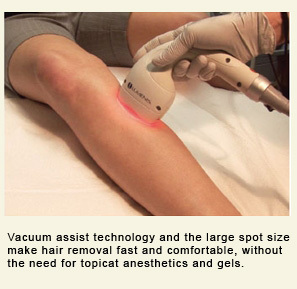 At Gaughf Dermatology we offer the latest technology for laser hair removal in Savannah. 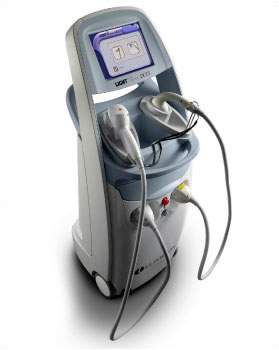 The LightSheer Duet laser hair removal system is faster, less painful, and requires fewer treatments than other laser hair removal lasers on the market. We are incredibly excited to offer this most advanced vacuum assisted technology available for permanent hair reduction. Excessive hair growth is classified as either hypertrichosis or hirsutism. Hypertrichosis is the presence of excess hair in a normal or abnormal pattern. This may be inherited (genetic), or due to medications, hormones, malnutrition, tumors, or metabolic problems. Hirsutism is the presence of excess hair in women in a male pattern such as the beard, mustache, or lower abdomen, and may be due to hormonal problems, medications, tumors, or heredity. In these cases, your provider at Gaughf Dermatology will determine if blood work is needed. There are many ways of hair removal including shaving, plucking, electronic tweezers, radiofrequency tweezers, waxing, threading, depilatories (creams), and electrolysis (inserting a needle into each hair follicle one at a time followed by an electric spark to burn out the follicle). 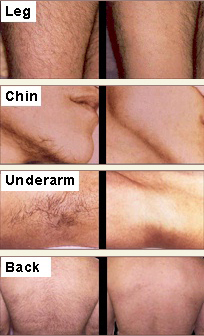 Most of these methods of hair removal, however, are temporary. Lasers offer the only method for permanent hair reduction; our laser hair removal offers quick results with optimal safety. With the larger handpiece the back or legs can now be treated in 15 to 20 minutes with minimal discomfort. A large area of the skin can be treated at one time making laser hair removal cost-effective and faster than other methods. Lasers send an energy beam through the skin that is absorbed by dark pigment (melanin) present in the shaft of the hair follicles. Since hair cycles as it grows, repeated treatments are necessary to destroy about 80 percent of the hairs. Our LightSheer Duet laser hair removal also treats dark skin types safely and effectively. Darker hair (black, brown) responds best to the laser, while lighter hair (white, gray, or red) is less responsive; for lighter hair, waxing is offered at Gaughf Dermatology as well. By having your laser hair removal treatment at a specialized dermatology clinic such as Gaughf Dermatology, you are ensuring not only well-trained & supervised personnel, but also the most effective and safest equipment available. A provider is always available should questions or additional concerns arise. Laser hair removal should be performed under the direct supervision of a dermatologist or physician assistant, a physician who is trained to help manage hair and skin problems. For diagnosing and treating excess hair, we provide the necessary expertise to give you the best results in laser hair removal.